Following the madcap multiversal appeal of 2014’s Spider-Verse, Marvel is bringing back the cavalcade of alternate reality Spiders for 2018’s Spider-Geddon. You know, like Armageddon, except not at all a functional pun. Fans of Spider-Punk (yes please), SP//dr, and the Spider-Man of Japan (YES) will find all their wild Spider-Man re-imaginings in full force. 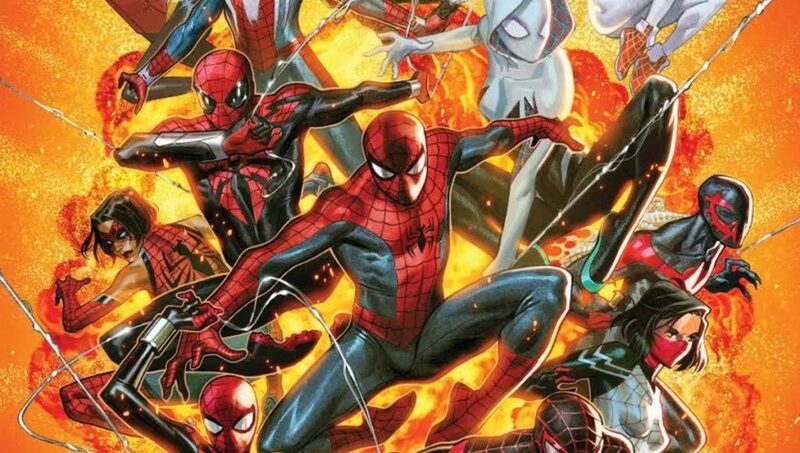 Spider-Geddon promises to unleash an army of alternate reality Spider-Men (and women! ), who must band together in order to fend off their collective extinction. If you like “What Ifs,” or reimaginings of the classic Spider-Man origin story, or just love cross media variations of the Spider-Man character in a calvacade of cool costumes, Spider-Geddon is for you. Like Spider-Verse before it, Spider-Geddon launches with an “Edge of Spider-Geddon” miniseries, which operates as a “Tales From Alternate Reality Spiders” series of one-off stories. Spider-Geddon proper then begins with Spider-Geddon issue #0, on through its conclusion. You can find a full reading order of collected editions and each individual issue below! Despite publication after Spider-Geddon #3, Spectacular #312 should be read in conjunction with issue #311. This helps make Miles Morales involvement align with the main event issues. when will the full event reach unlimited? Looks like the last issue of Spider-Geddon (#5) came out mid-December so it won’t be on Unlimited until mid-June. Is it worth it to get all the comics in the event? Shouldn’t Vault Of Spiders be around Spidergeddon #1? I think this needs to be updated for the reading order of individual issues. When exactly does Superior Octopus take place? Why isn’t there a Spider-Geddon #0 on the list?